This article has a separate continuity. This article is in a separate continuity, which is related to Stargate. Be sure that your contributions to this article reflect the characters and events specific to this continuity only. This article is about the movie but yet separate continuity facility. For the canon location, see Cheyenne Mountain complex. The Creek Mountain facility is a complex located in Colorado, USA. It has been the location of the Project Giza. Creek Mountain is operated by US Air Force military. Is has at least 28 underground levels, in which are stored many secret devices. Before beeing the location of the Stargate, this facility was a former nuclear missile silo which has been completely converted (Stargate). Doctor Daniel Jackson is driven to the Creek Mountain facility. There, in sub-level 28, he discovers the Giza coverstone and two weeks later, the Stargate. This military facility has been retconned in the Stargate SG-1 series. 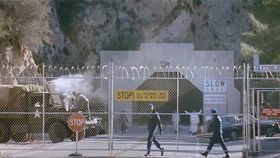 In "Children of the Gods" and the following Stargate episodes, the Cheyenne Mountain complex (a real-world location) is the official secret location for the Stargate Program. In the dialogue between Colonel Jack O'Neill and the officer inside the elevator leading down to sub-level 28, O'Neill stated he's been there (in the facility) before. Unlike the Cheyenne Moutain complex, the Creek Mountain facility is purely fictional. There is no such installation in real world. According to the IMDb website, The complex entrance is the same showed in the 1983 movie WarGames, which was referenced as NORAD Cheyenne Mountain, Colorado Springs. Cheyenne Mountain complex, the canon Stargate Program facility. ↑ This point has to be checked. This page was last edited on 3 October 2013, at 11:32.